Regarded as the father of Italian humanism, Francesco Petrarch brought the classical world of Greece and Rome to life with his enthusiastic scholarship of the words and wisdom of ancient writers. Poet, philosopher, and moralist, Petrarch captured the vitality and variety of life in his work. He is recognized for the lyric poetry in his Canzoniere: The Sonnets and Stanzas of Petrarch (1470), a collection of poems expressing his unrequited love for a woman named Laura. Primarily, however, Petrarch is remembered as the writer who popularized the Italian sonnet form—also referred to as the Petrarchan sonnet—that influenced poets throughout Europe for more than three hundred years. In 1312, the family moved to Avignon, France, where Petrarch’s father established himself as a successful lawyer. After being privately educated by tutors, Petrarch began studying civil law at the University of Montpellier in 1316. Extraordinarily bright and intellectually curious, he spent so much of his allowance on the works of classical poets that his angry father once burned the young Petrarch’s library except for works by Cicero and Virgil. Love for Laura. According to literary legend, while attending services on Good Friday in 1327, Petrarch saw and fell in love with a woman he thereafter called Laura. For the rest of his life, he wrote verse about his unrequited love for her, poems he initially collected into a volume around 1336 and from then on reworked. Petrarch became a private chaplain to Giovanni Cardinal Colonna in 1330, a position he would hold for almost twenty years. During those years, Petrarch proved a prolific writer, producing not only poetry in both Latin and Italian, but also essays on topics as diverse as destiny, famous people, religious life, and the nature of ignorance. As he traveled on diplomatic business, Petrarch composed or revised most of his major works and maintained faithful correspondence with friends, scholars, and the nobility of Europe, as evidenced by the hundreds of letters he wrote. Poet Laureate. Included among Petrarch’s major poetic works are Africa (1396) and Triumphs (1470). Africa is an epic poem celebrating the victory of the Roman general Scipio Africanus over the Carthaginian general Hannibal in the Second Punic War. The poem is written in Latin hexameter, while Triumphs is written in Italian terza rima—lines of eleven syllables, arranged in groups of three and rhyming ‘‘ababcbcdc’’—the measure Dante uses in his Divine Comedy. Petrarch’s most popular work during the Renaissance, Triumphs, a long allegorical poem, depicts six stages of the soul’s spiritual journey: Love, Chastity, Death, Fame, Time, and Eternity. The popularity of this work was the result of its encyclopedic catalog of famous people, its visionary outlook, and its emphasis on salvation through God. Because his works were widely distributed, Petrarch was admired for his talents as a lyric poet and famous for his passion for the unknown Laura. He received simultaneous invitations to be named poet laureate in Rome and Paris in 1340 and ultimately accepted the position in Rome. On Easter Sunday a year later, in an elaborate coronation ceremony held in the Palace of the Senate on the Capitoline Hill, Petrarch was named the poet laureate of Rome. In the classical tradition, Petrarch was crowned with laurel leaves. It is believed that no ceremony of such magnitude had taken place for over a thousand years. Focused on Seniles at End of Life. After years of traveling and writing, Petrarch went to Padua, in June 1361 to avoid the Milan outbreak of the Black Plague— a deadly pandemic of the bacterium commonly known as the bubonic plague—that had taken the lives of Petrarch’s sons, the woman believed to have been his beloved Laura, and several of his friends, including Cardinal Colonna. In Padua he began a new collection, Seniles. In the fall of 1362, Petrarch moved to Venice, where he received a house in exchange for the bequest of his library to the city, residing there until Francesco da Carrara, his patron in Padua, gave him some land in Arqua, near Padua. In 1370, Petrarch retired to a house he had built there and studied, worked on Triumphs and Canzoniere, and received friends and family. At the time of his death in July 1374, Petrarch was working on a biographical letter intended to end the Seniles. 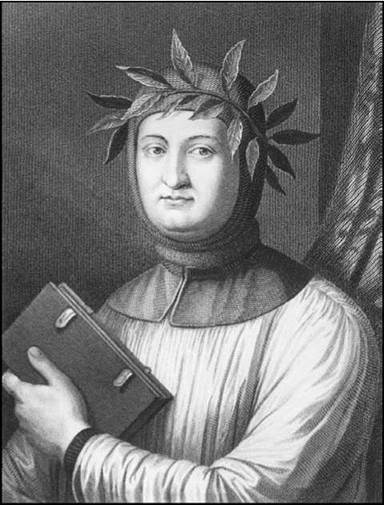 Giovanni Boccaccio (1313-1375): Italian author. A contemporary of Petrarch, Boccaccio is the author of The Decameron (c. 1353), a collection of tales told by seven ladies and three men who are fleeing Florence to escape the plague. John of Gaunt (1340-1399): English royalty. The father of King Henry IV, Gaunt was a prominent political figure during the reign of King Richard II, as well as Geoffrey Chaucer's patron. Inca Roca (birth and death dates unknown): Inca ruler. Roca ruled from around 1350 to 1380, and organized schools for boys of the imperial class. Kazimierz III Wielki, Kazimierz the Great (1309-1370): Polish king. The last king of Poland of the Piast dynasty, Kazimierz the Great helped create a strong, stable nation by establishing peace with the Czechs in 1334. Andrew of Wyntoun (c. 1350-c. 1425): Scottish poet. Wyntoun wrote The Orgynale Cronykil (c. 1420), a history of the world from creation to the accession of James I.
Nicholas Trivet (c. 1258-c. 1334): English prior and author. Trivet is best remembered for writing three histories in the 1320s: an Anglo-Norman chronicle that covers the creation to 1285, which contained the story of Constance later told by Chaucer; Annals of Six Kings of England 1136-1307 (c. 1320), which provided guidance for Edward I during his reign; and Historia ab orbe Condita (c. 1327), an encyclopedic history influenced by Vincent of Beauvais. Petrarch’s work is filled with extended metaphors and references to classical antiquity, features that exemplify Renaissance poetry. He is widely believed to have been influenced by the study of Greek and Latin and was recognized for reviving interest in the classical languages. In particular, he emulated famous Romans Virgil, Cicero, and Seneca in his work and wrote biographies of famous Romans, On Illustrious Men (begun c. 1337). Petrarch was also influenced by the Italian sonnet, a form with an octet rhyming in the pattern ‘‘abbaabba’’ and a sestet following the pattern ‘‘cdecde.’’ He is credited with popularizing the Italian sonnet, and it is generally regarded as his most important contribution to English writers. Importance of Italian and Latin. Having lived both in Provence and in Italy and having been a student of the classical lyric, Petrarch was the inheritor of an ancient and thriving tradition. Despite his notion that Latin was a more noble instrument of expression, he must have sensed that the Italian language provided him the means of externalizing the subtlest nuances of his inmost feelings and thoughts. Although many of his Latin compositions are more forward-looking, the Triumphs, which is medieval in design, and the Canzoniere, which belongs to an ancient tradition of love lyrics, have remained the most popular, perhaps because they were written in the vernacular and because they reflect Petrarch’s own highly refined sensibilities and his wondrous skill with a language that was not wholly his own. Laura and the Canzoniere. In its final form, the Canzoniere contains 366 poems: 317 sonnets, twenty-nine cazone (songs), nine sestinas, seven ballads, and four madrigals. The collection is divided into two sections. Composed of 266 poems, the first section primarily focuses on Laura during her lifetime, with some political, moral, and miscellaneous verse interspersed. The poems in the second section are memories of Laura after her death. For the most part, the narrator of the Canzoniere contemplates his passion for Laura, the suffering caused by unrequited love, and his efforts to free himself from his desire for an unobtainable woman. The last poem of the volume closes with a plea to the Virgin Mary to end the narrator’s heartache. While the existence and identity of Laura remain unknown, it is obvious that Petrarch loved her through the poetry he created, and critics have determined that she has served as the embodiment of feminine virtue and beauty for generations of poets. Influence. Petrarch’s influence on the literary world was immediate and vast. Most all of the great European writers continued Petrarch’s legacy, whether through imitation or translation. Italian poets Ludovico Ariosto and Torquato Tasso, Spanish author Luis de GrSngora y Argote, French poet Pierre de Ronsard, Portuguese writer Luis de Camoens—Petrarch provided an innovative, captivating form for all of these writers. Indeed, even much of the English poetry by such writers as Chaucer, Donne, Wyatt, Surrey, and Shakespeare owes its craft to Petrarch, who introduced the technique of cataloging physical perfections, along with the resulting feelings such adoration inspires. The Hunchback of Notre Dame (1831), a novel by Victor Hugo. Archdeacon Frollo falls hopelessly under the spell of the beautiful gypsy girl Esmeralda in this novel set in fifteenth-century Paris. Great Expectations (1860-1861), a novel by Charles Dickens. Although Estella's ability to love any man has been destroyed by the bitter Miss Havisham, Pip, the main character, seeks a romantic relationship with Estella throughout the novel. The Great Gatsby (1925), novel by F. Scott Fitzgerald. Jay Gatsby, the novel's protagonist, spends his life trying to attract the attention of the pampered, pretty socialite Daisy Buchanan. Critics consider Petrarch not only one of the greatest love poets in all of world literature, but also the founder of humanism, the intellectual, literary, and scientific movement that based every branch of learning on the culture and literature of classical antiquity. His works in the Italian sonnet form are generally regarded as his most significant contribution to literature. Numerous critics have credited Petrarch with reviving traditional poetic forms. Poetry. Critics laud the importance of Petrarch’s Italian sonnets. Observes Christopher Kleinhenz, ‘‘In their attempts to define the excellence of the Petrarchan sonnet, critics praise it for its precision and compactness, for its graceful symmetry and vibrant musicality, and for its noble sentiments and intimate tones.’’ Additionally, scholars note the relationship between form and meaning in Petrarch’s poetry, his imagery, and his use of intricate syntax. Furthermore, critics frequently discuss the tension between body and spirit present in Petrarch’s works, his efforts to reconcile Christian and pagan ideals, his extensive use of classical mythology, and his celebration of figures from the classical period. 1. Some scholars have presented evidence to show that Laura was an actual person, although Petrarch never mentioned her in any of his correspondence. Investigating the facts available, determine whether you agree to the existence of a real Laura in Petrarch’s life. If she were real, do you think Petrarch ever spoke to her? Did she ever know about his feelings for her? Create a presentation that displays your findings. 2. Pretend you are Laura, the object of Petrarch’s desires, to whom he wrote many love poems. Write Petrarch a letter refusing his love, responding to specific lines in his verse. Explain the circumstances in both of your lives that prevent you from being together. 3. How is Petrarch important in the ways Romeo, the male protagonist of Shakespeare’s Romeo and Juliet, experiences and talks about love? To what extent do you believe Shakespeare would have been familiar with the work of Petrarch? Write an essay that presents your conclusions. 4. Why has Petrarch been called the inventor of modern research? How did he revive culture? Write a paper that outlines your beliefs on these subjects. 5. Read Petrarch’s ‘‘Letter to Cicero.’’ Determine why Petrarch compares himself with Cicero. Why was Petrarch disappointed in Cicero? What does he accuse Cicero of? Do you think Petrarch was really writing to the dead Cicero, or was he writing a letter to himself? Write a paper that addresses these questions. Bergin, Thomas G. Petrarch. Boston: Twayne, 1970. Bernardo, Aldo S. Francesco Petrarca: Citizen of the World. Albany: State University of New York Press, 1980. Greene, Thomas M. The Light in Troy: Imitation and Discovery in Renaissance Poetry. New Haven, Conn.: Yale University Press, 1982. Kennedy, William J. Rhetorical Norms in Renaissance Literature. New Haven, Conn.: Yale University Press, 1978. Kleinhenz, Christopher. Medieval Italy: An Encyclopedia. New York: Routledge, 2003. Roche, Thomas P., Jr. Petrarch and the English Sonnet Sequences. Brooklyn, N.Y.: AMS, 1989. Waller, Marguerite R. Petrarch’s Poetics and Literary History. Amherst: University of Massachusetts Press, 1980. Wilkins, Ernest H. A History of Italian Literature. Cambridge, Mass. : Harvard University Press, 1954. ‘‘Petrarch (1304-1374)—in full Francesco Petrarca.’’ Books and Writers. Retrieved April 25, 2008, from http://www.kirjasto.sci.fi/petrarca.htm.